Casio Label Printer Mouse Wows With Ancient Technology | OhGizmo! The technology industry is a fast-paced cut-throat environment. You must innovate, or risk falling behind the pack. Convergence products are always a good way to give yourself an edge. People love having one gadget that can take the place of two or more devices. That is unless the end result is hideous. 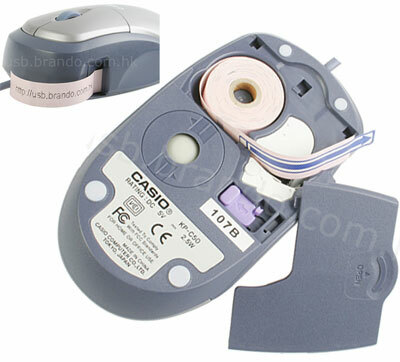 A perfect example of a seemingly good idea gone wrong would be Casio’s Label Printer Mouse. You can likely guess from the name what this product does. Not only is it a horribly ugly mouse, but it also prints out labels. My favorite feature of this product is the mysterious ball that sits where one would usually find an optical sensor. I’m not entirely sure what this ball does, I can only assume that it’s some sort of archaic tracking device. I suppose that if you print off a ton of labels and don’t mind using a very ugly mouse, this could be something you’d want. It can be had for $29, label refills come in packs of 3 for $14.